Unfortunately, we no longer have this slot available. But please don't leave, look at some of the best new slots that I've recently found. Playtech Marvel superhero slots have long held power in the online casino landscape. With their explosive bonus features, dynamic graphics and flexible betting options, real money players have come to love them. Now, thanks to Playtech mobile responsive software we see some of Marvel’s most capable in the form of superhero slots for iPad, iPhone and Android. NextGen Gaming has been grabbing the headlines with its trilogy of major DC superhero slots – one of which focuses on Batman. There’s really no need for a bigger title as Batman speaks for himself, but does the slot live up to the famous nature of the character? 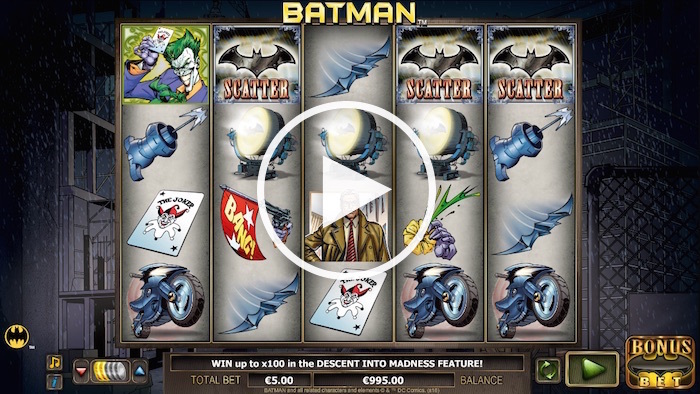 The NextGen Gaming Batman slot is a 5×4 game featuring 50 paylines. It has some features in common with the other two DC Comic book slots just released – The Flash and the Green Lantern. But it has some unique elements as well, as you’re about to discover. It’s not difficult to make a DC slot engaging; you just combine Batman with the chance to win real money! The tone of the game is a little darker than you might expect, with the backdrop seeming to show a dark rainy night. The Batman sign and logos are present on the reels, along with the joker (a playing card version… but of course) and some other familiar characters too. The graphics are impressive, and if you’ve seen The Flash and the Green Lantern as well, you will know all three slots have a similar feel to them. We’ve already mentioned the dark nature of the Batman graphics behind the reels, but that lightens up if you activate the Bonus Bet feature. We’ll come to that in a moment. The game has the relevant controls at the bottom of the screen, and it does also offer an autoplay option. The gameplay is very smooth and shouldn’t present you with any issues at all. If you’ve tried one of the other slots in the series, the Batman slot from NextGen will have a familiar feel from the start. However, it does have its own particular features, as you’ll see in a moment. There are five pages included on the payout table. The first reveals Batman to be the wild, capable of appearing on the second, third and fourth reels. He can take up one to four positions in each spin. Commissioner Gordon and the Joker appear among the other symbols, and are worth varying amounts for getting just two or more on a line. The Batcycle and Batmobile can also appear, as can a few other relevant symbols. All prizes pay from left to right as you’d expect, apart from the scattered Batman logo and the bonus Batman logo. Firstly, you should decide whether you want to play an additional 10 coins per spin to activate the Bonus Bet. This is present in all three DC Comics games from NextGen Gaming, and in each case it grants potential access to a special feature. In this case, it is the Descent into Madness feature. The pay table doesn’t actually tell you much about this, but you have to get three bonus symbols to unlock it. You’re then off to a prison to try and prevent the Joker’s team from breaking out. Cash rewards are on offer for each villain you take out with your Baterang. You then meet the Joker. You have to knock him down three times in order to win another bigger cash prize. If the wild Batman appears, he can substitute for everything apart from the two Batman logos, which represent the bonus and scatter symbols respectively (they are both labelled as such). Base game wins with Batman wilds will be doubled from the normal values. Also in the base game, if you get Commissioner Gordon on the first reel and the Bat Signal on the fifth (or the other way around), you will unlock the re-spin feature. This gives you three re-spins and stacked wilds will show up randomly on any of those middle three reels. They are also held in place and any wins will be doubled. We liked this feature because it means you don’t have to wait for the Descent into Madness feature to trigger to enjoy a special feature. You can start with a penny per game, which means 50p will cover every line. If you want to use Bonus Bet (and it’s worth it to activate the Descent into Madness feature) the minimum goes up to 60p a spin. Big-budget players have a maximum of £100 per spin without the Bonus Bet and £120 per spin with it. The house edge delivers an RTP of 95.79%, which is pretty similar to the RTPs in place for the other two DC Comic slots. Obviously, the actual RTP varies depending on whether you choose Bonus Bet or not. 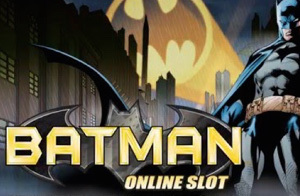 The best DC superhero online slots have all arrived now, and while you will probably have your own favourite from among the three, Batman is definitely a good addition to this genre. It’s not the first Batman online slot to be released, but it should be a popular game that comic book fans in particular will appreciate. Now you just have to decide whether this will be the best of the three comic book slots now available from NextGen Gaming.